Jeffrey Aaronson, Garda Alexander, Jacquline Devreux, Dasha Fursey, Hubertus von der Goltz, Martin C. Herbst,Ottmar Hörl, Kaeseberg, Micha Klein, Valery Koshliakov, Matthias Köster, Oleg Kulik, Angela Lergo, Jürgen Möbius, Not Vital, Yoko Ono, Anna Parkina, Irina Polin, Salustiano, Heinz Schaffner, Barbara Schaubacher, Helmut Sennhauser, Sergey Shekhovtsov, Vitas Stasunas, Thomas Thüring, Your favorites, Qin Yufen, Yun Lee. 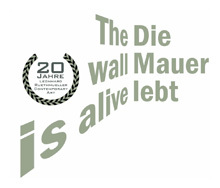 The wall is alive, in this way the gallery Leonhard Ruethmueller opened as a hundredth gallery its first exhibition in 1989, in Basel. 143 exhibitions and exactly 20 years later, we cordially invite you to our birthday and jubilee exhibition into the Hall 33. Around 30 international artists of gallery’s programme from the beginning until today will present an exciting selection of works on canvas and paper, sculptures, objects and installations. We cordially invite you and your friends to our Vernissage Preview on Tuesday 15 December 2009, from 18 pm. Monday to Friday 15.00 – 19.00 pm | Saturday: 11.00 – 17.00 pm. Closed from 24. December till 3. January 2010. The gallery at the Gerbergasse remains closed during the jubilee exhibition. Please note the revised opening hours during the holidays. Finissage 29. January 2010. Please find enclosed the invitation. We are looking forward to see you at the 20 Years Anniversary Exhibition.